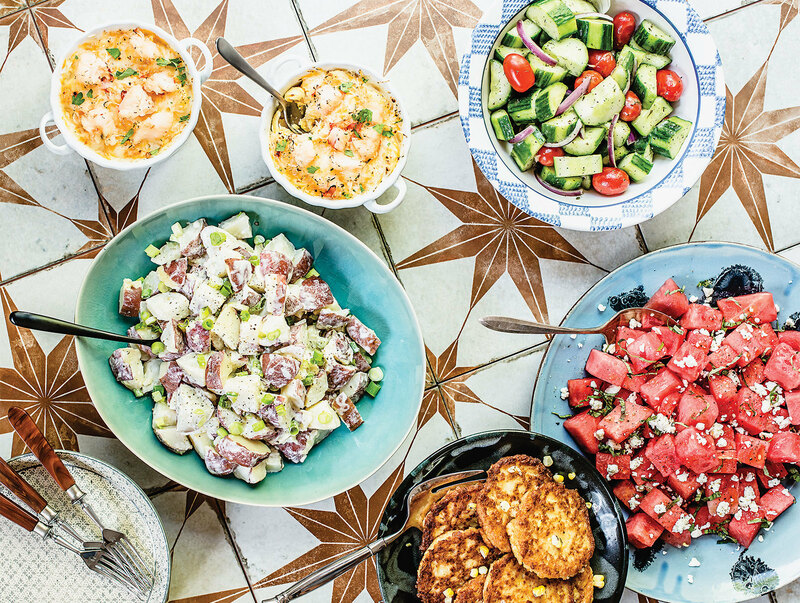 Move full steam ahead with our tips and tricks for a repast to remember. Edited by Jane Marion. Photography by Kate Grewal. Written by Jane Marion and Lydia Woolever with Lauren Cohen and Jess Mayhugh. Illustrations by Danielle Dernoga. 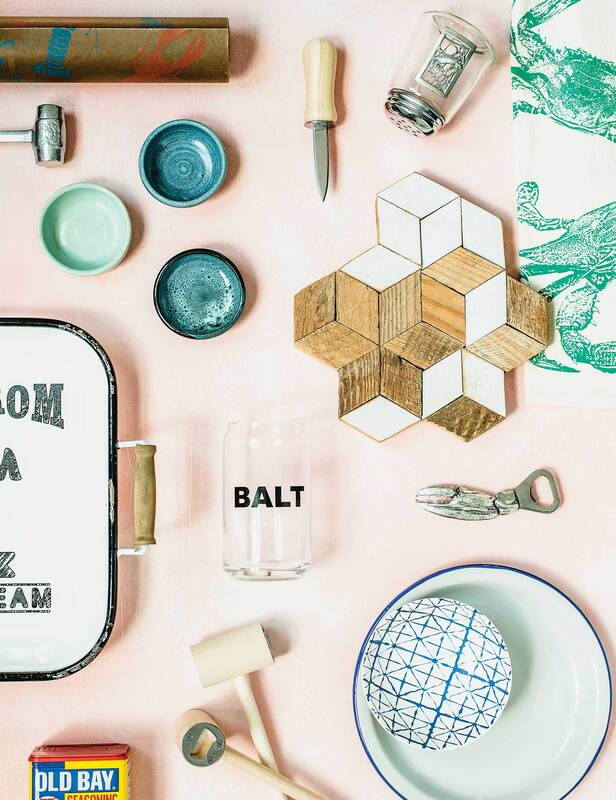 Food and prop styling by Limonata Creative. There are meals—and then there are feasts. What’s the difference? 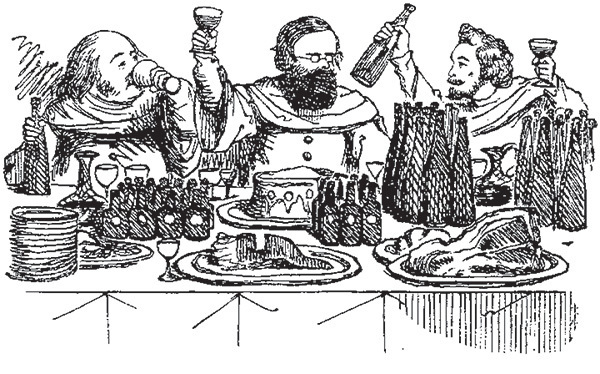 Think of a feast as one for the ages: Jesus’ Last Supper, King Midas’ funeral banquet (during which each guest purportedly drank at least a gallon of wine and mead), or Dr. Seuss’ festive Who-ville Who-roast-beast feast. While a meal is what you eat when you need sustenance, a feast entails gluttonous excess, with food—and drink—freely flowing and hordes of hungry guests in attendance. A meal is eaten; a feast is devoured. A meal is a pause in the day; a feast is the day. You get the idea. In Maryland, feasts typically center around our state treasure, the blue crab. Picking steamed crabs, especially at the height of the season during peak warm-weather months, is always cause for celebration. 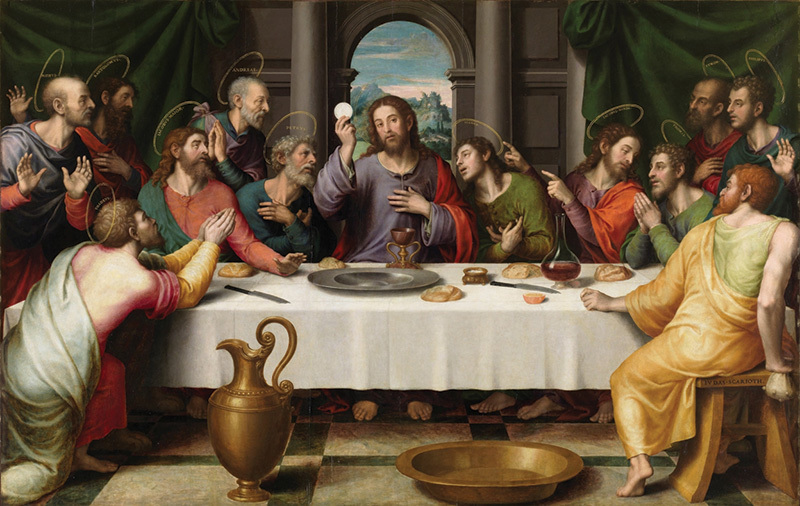 THE LAST SUPPER is a subject that has inspired many artists through the ages, including juan de juanes’ painting, ABOVE. What we can say with certainty is that, here in the Old Line State, sitting down to pick crabs is now a way of life. And everyone has their own traditions, whether you head to your favorite seafood shack on the water for bushels of blues, start from scratch with your own fresh catch from the bottom of the bay, or haul home a treasure-filled box and have at it for hours in your own backyard. And while that may be the case for dyed-in-the-wool picking purists, we’re not above kicking it up a notch with specialty cocktails (we have a crush on watermelon crushes), crème de le crab craft paper, and next-level sides, as you’ll see on these pages. However you eat them, picking the hard-shelled sweeties, aptly named Callinectes sapidus, or “savory beautiful swimmers,” is like no other culinary experience. There will be cuts (and burns, as the salt from the spice stings), crab “dirt” forming under your nails, and likely a few Tide stick emergencies from the carnage. (Pro tip: Don’t wear white, even if it’s after Memorial Day!) 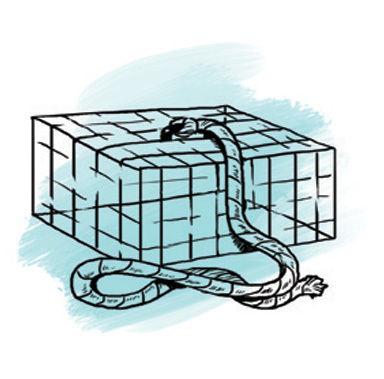 There are few rules —although we did check in with the International School of Protocol for some tips and tricks—and that’s part of the joy of it all. For Marylanders, knowing how to extract the morsels of meat is practically encoded in our DNA. It’s synonymous with languid summer days, a sense of conviviality, and, above all, a return to home—even if we’ve been here all along. Mind your manners when eating crabs. 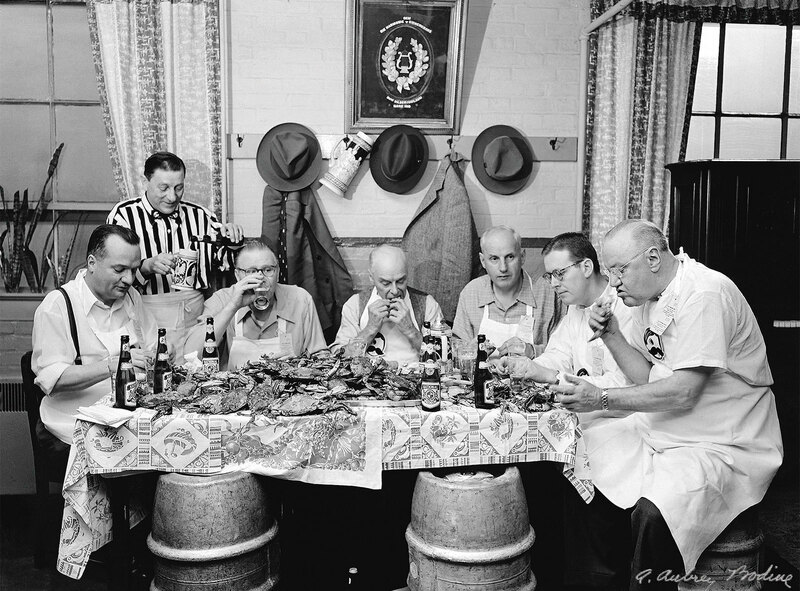 In Maryland, of course, eating with your hands only adds to the fun of the feast. In fact, the popularity of picking in public coincided with the easing of societal strictures. 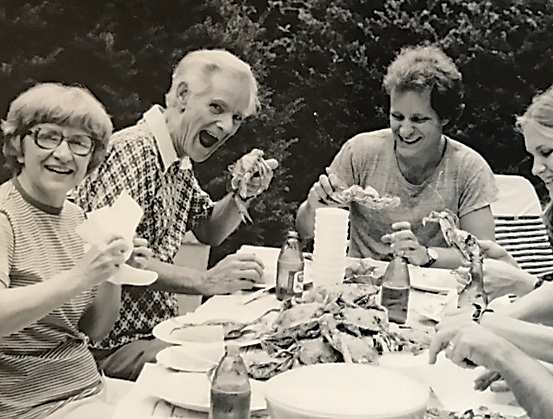 “Sitting at a table covered in newspaper and eating a pile of crabs is a ‘trickle-up’ tradition that came with the informalization of society,” says Kate Livie, an expert on the food and folkways of the Chesapeake region. Don’t eat more than your share. In other words, pace yourself in front of the common pile. Don’t lick your fingers, no matter how much crab spice builds on your hands. Do chew with your mouth closed—it’s easy to get lost in the moment. Do use your napkin (or paper towels). Do wash your hands prior to the feast. Hygiene counts. 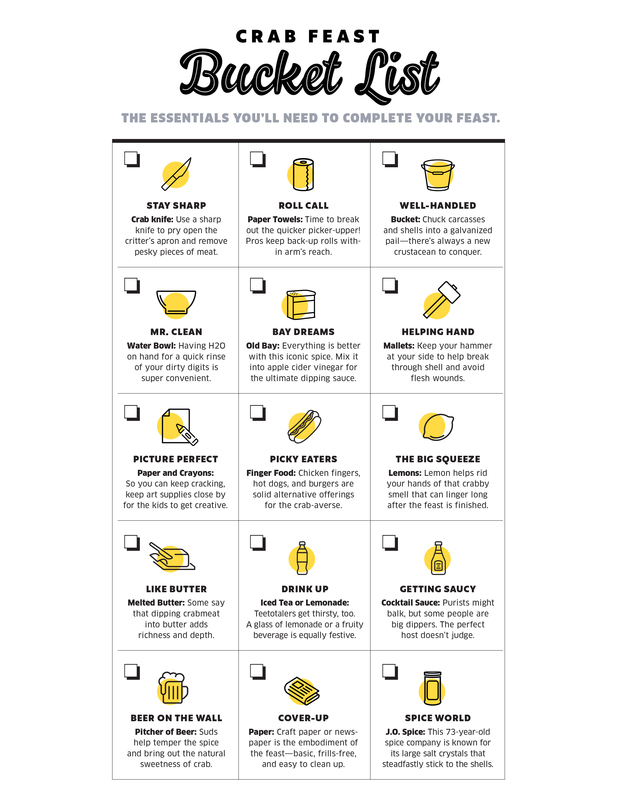 When planning a feast, décor options abound: Go the traditional down-and-dirty route (brown paper, mallets, knife, pail) or plan something a little more upscale using stylish gear to help fancify your feast. Seafood Boil Paper Roll ($33) at Becket Hitch. Pewter crab mallet—part of four-piece gift set, Spice shaker, Can of Old Bay ($64) at Curiosity. Small ceramic bowls ($4/each) at Wild Yam Pottery. Oyster shucker—part of seafood set. Lobster cracker and seafood picks, not pictured, ($36) at Trohv. Black & White Enamel Farm Tray ($30) at Su Casa. BALT glass ($12) at Becket Hitch. Magruder Shape No. 4 Wall Art by Forty Third Place ($50) at West Elm. Crab Tea Towel in Teal by Fuzzy Mug ($18) at Marlow. Crab Bottle Opener ($32.95) at Curiosity. 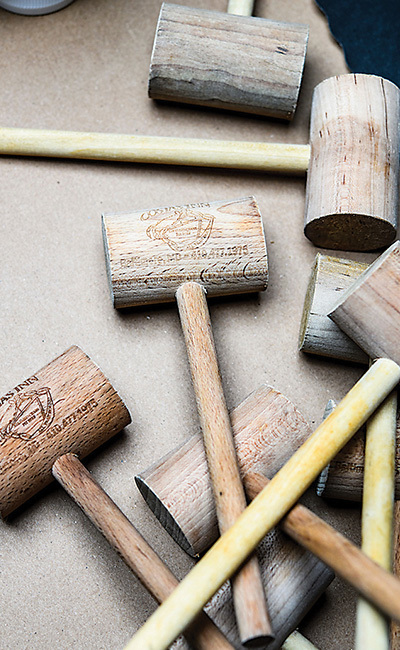 Crab Mallet Bottle Opener ($9.95) at Trohv. Small Sibori bowl ($10) at Becket Hitch, EGENDOM enamel plate ($2.99) at IKEA. 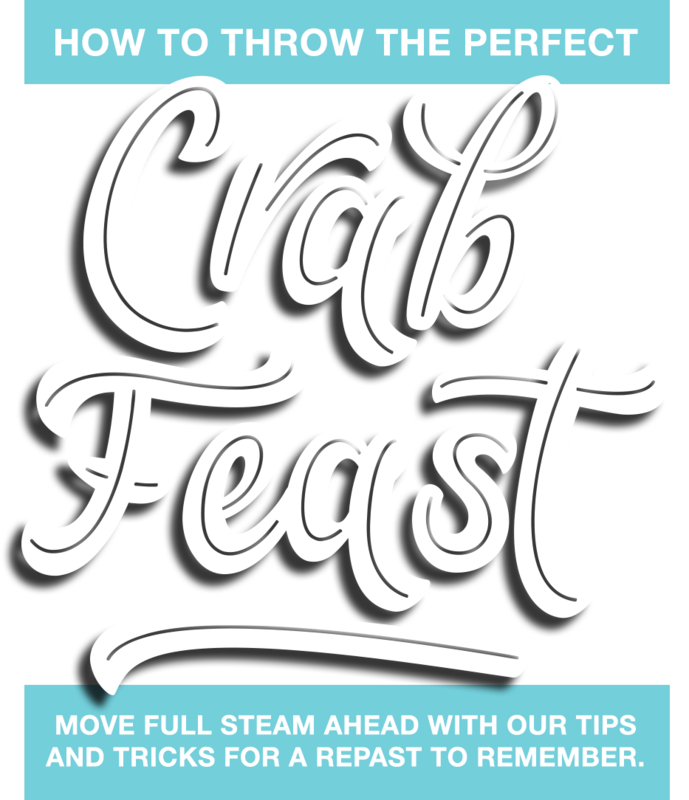 Download the essential list you’ll need to complete your crab feast. Q. How do I recognize a Maryland crab? Q. Why do Marylanders steam their crabs? Q. Why is Maryland crab so superior? Fun Fact: Crab SHELLS CONTAIN A pigment THAT responds to heat. When dumped into boiling water, The pigment separateS and transforms the shell’s color into a ruby red. Q. When is the best time of year to throw a crab feast? Q. 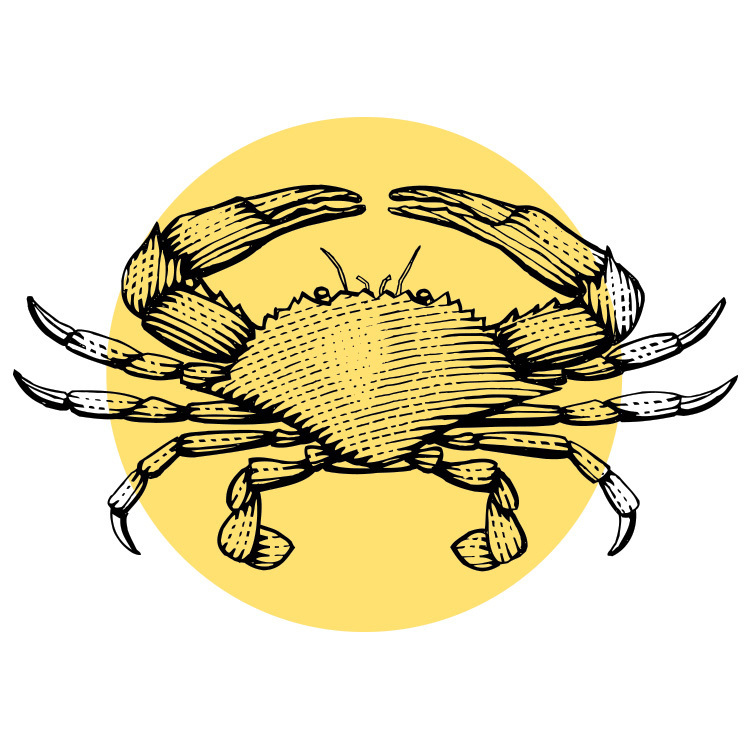 Why do crabs and beer make such good pairing partners? Q. Why is the blue crab blue? If you’re the DIY type, head to one of these purveyors to buy your beautiful swimmers, then eat them at home. Some spots will even deliver them to your door. Let’s be honest, man cannot get full on crabs alone—here are some sides to round out your meal. Chris Brohawn knows a thing or two about crabs and beer. 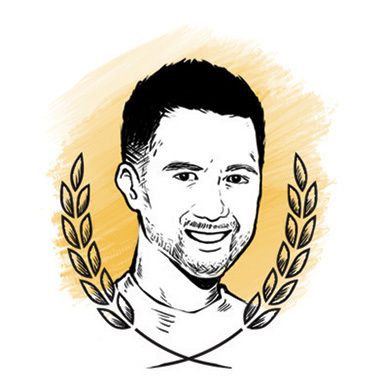 As a Cambridge native and co-founder of RAR Brewing, he’s spent the majority of his life crabbing, picking, and making suds. “I’ve put one too many chicken necks in the water,” he says with a laugh. “Whenever other brewers visit for collaborations, we always take them out for a crab feast.” Brohawn says that an ideal beer for crabs should be light in body with citrus hops—like RAR’s Country Ride. 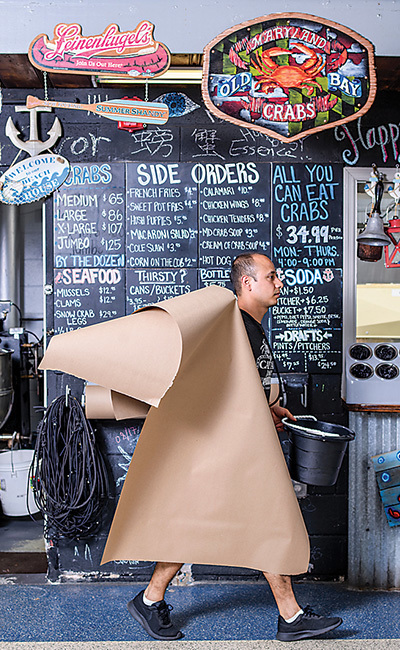 “You don’t want to copy or mask the flavor of crabs,” he says. “They should be the stars of the show.” No matter what he’s drinking, Brohawn sticks to the same tradition: Whoever grabs a mallet out of the bag first has to chug a beer. When the weather is clammy, the crabs are spicy, and the watermelons are juicy, why not take the iconic summer fruit for a spin in the shaker? 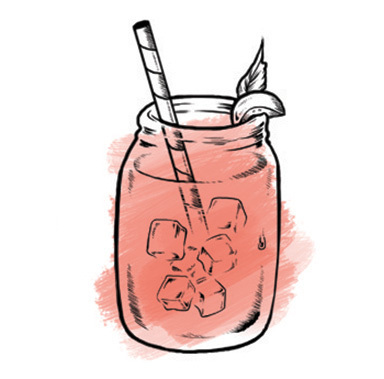 In a martini shaker filled with ice, combine vodka, watermelon juice, lime juice, and simple syrup. Shake until combined. Divide mixture evenly into two glasses. (Use Mason jars to make a style statement.) Add crushed ice and top off with lime soda. Garnish with mint. Add a striped paper straw! As the saying goes, teach a man to fish and you feed him for a lifetime. Happy crabbing. 1. Purchase state-approved recreational wire crab pot at local boating or fishing store. 2. Tie a rope to the pot and secure to dock piling. 3. Add bait, such as chicken necks, to trap. 4. Lower into water for several hours or days. 5. 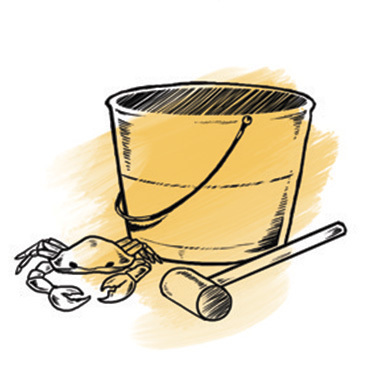 Pull up crab pot, open lid, shake out crabs into basket, and refrigerate or steam ASAP. Follow these simple tips for plucking the most meat. 1. Break off appendages, except for swimmer legs, and set aside for later picking. 2. Using your fingers or a knife, pull back the apron flap from the crab’s underside to gently separate the top from the bottom. Discard shell. 3. Remove crab gills and intestines (the mustard won’t hurt you but is an acquired taste), then break body in half. 4. Break each half in half again and remove outer membranes. 5. Pick out meat, and crack open claws and legs . . . 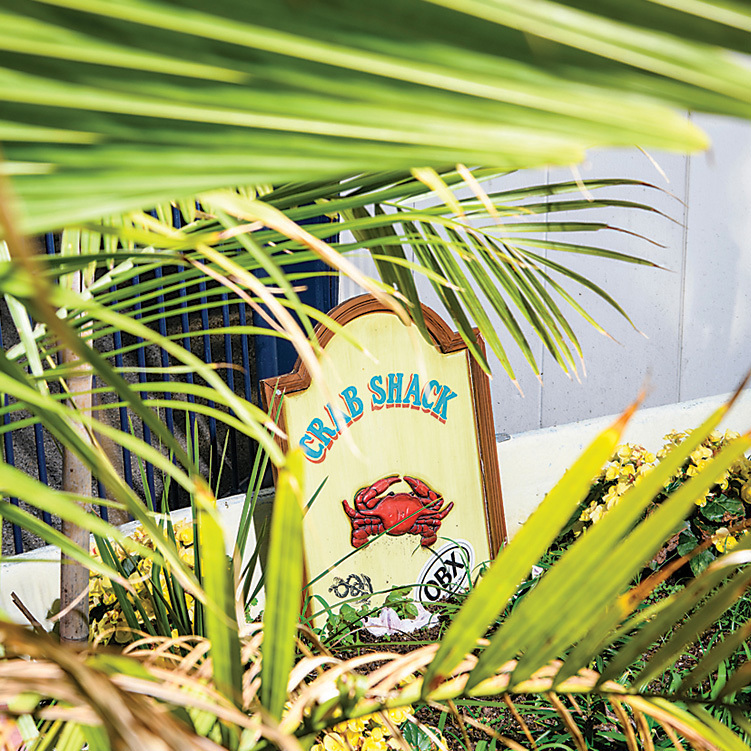 Located at the end of a strip mall in Canton, Bo Brooks could easily veer into touristy territory, but the 54-year-old crab house still gets the important things right. 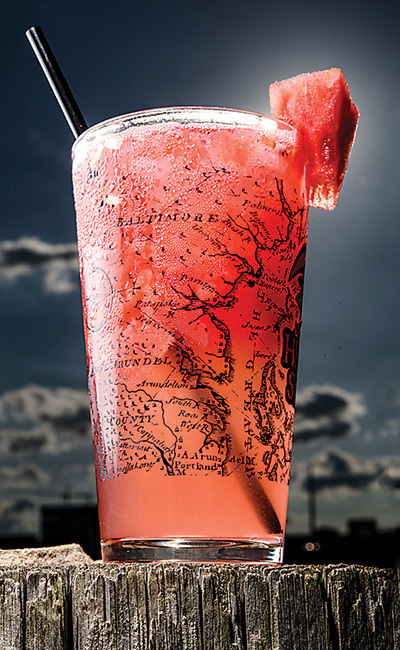 For starters, it offers unparalleled panoramic views of the Baltimore waterfront, a lively thatched-roof tiki bar out front, and even a roaming food truck when you’re craving crab on the go. We sat down at the restaurant early in the season, so only mediums were available, but they were meaty, well-spiced, and enhanced by the salty air. Our sides, including crispy, sturdy Boardwalk-style fries and an ear of corn swimming in melted butter and flecked with Old Bay, were noteworthy. The jumbo-lump crab cake was like grandma used to make. And a few tables over from us, some players from the Baltimore Brigade arena football team were clearly enjoying their meal—if you can feed those guys properly, you know you’re doing something right. If you’re looking for a real-deal Maryland crab feast, make your way to the picnic-tabled patio at Cantler’s. 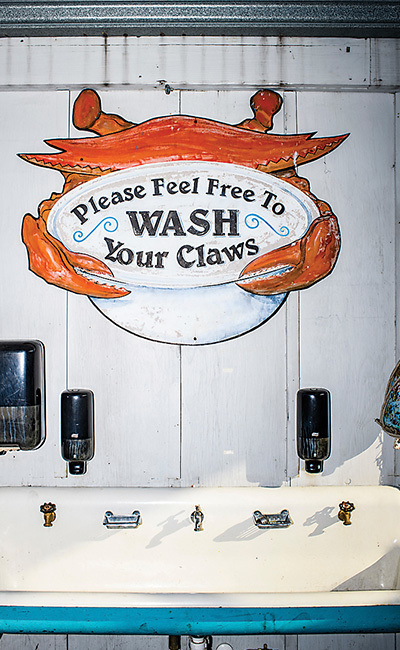 Nestled at the end of a winding back road near the Severn River, this four-decade-old institution is the place “where the watermen gather,” with local fishing vessels dropping off just-caught crabs at the quiet Mill Creek dock. You, too, can come by boat (though arriving by car is always an option) for a few rounds of fresh-steamed shells topped with J.O. Spice, a basket of hush puppies, and the meatiest clam strips you’ve ever encountered. A small chalkboard lists the daily prices ($75-115 a dozen on our late-spring visit), plus seasonal specialties such as sweet corn and soft-crab sandwiches. Several hours of cracking and cold cans of Striped Bass as the sun sets over the water make for peak pleasant living, indeed. Most people associate Captain James with the giant boat-shaped restaurant at the corner of Aliceanna and Boston streets. But the real fun takes place across the street at its seasonal outdoor crab deck. Open after 4 p.m., the waterfront spot features all the trappings of a proper feast: picnic tables, buckets of beer, brown paper, and a feel-good soundtrack on the stereo. Though the deck was packed with people the night we visited, our service was stellar, with constant drink refills. And our table was set up with all the condiments you could possibly want. All hard-shell sizes were available, but we opted for a dozen larges, and there wasn’t a dud in the bunch. Our crabs were packed with sweet meat and not a single one was steamed too long. Complement your crustaceans with Maryland-style hushpuppies, which are light, fluffy, and served with honey butter. Try to go toward the end of happy hour right before the sun sets to snag $3 Natty Boh drafts and maximize your view. PILE O’ CRABS AT CAPTAIN JAMES. 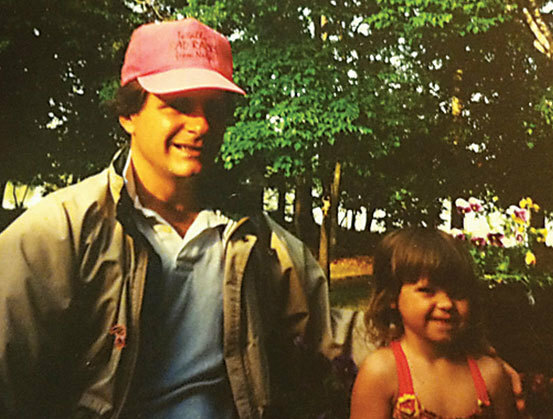 Tony Conrad has been a commercial waterman since 2003, known for his local seafood market that sells some of the most pristine seafood in town. His Perry Hall restaurant, open since 2014, continues that tradition. In fact, we’re fairly certain that the term “catch of the day” was invented here, since Conrad fishes for what’s on your plate himself aboard his beloved boat the Hannah Marie. The expansive menu lists plenty of apps to start your feast off right, including a soft pretzel smothered in creamy crab dip, and complementary buckets of Old Bay popcorn grace every table. But our heavy crabs—hot, dense, highly spiced—were the true delight. 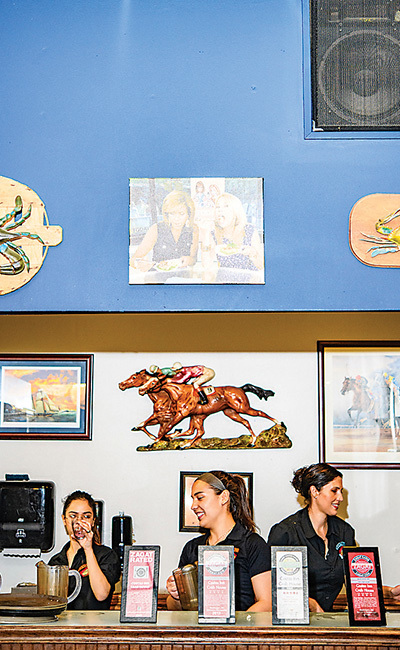 While Conrad’s bustling seafood market in Parkville is for takeout enthusiasts, this is the place for all the comforts of home without the big mess. 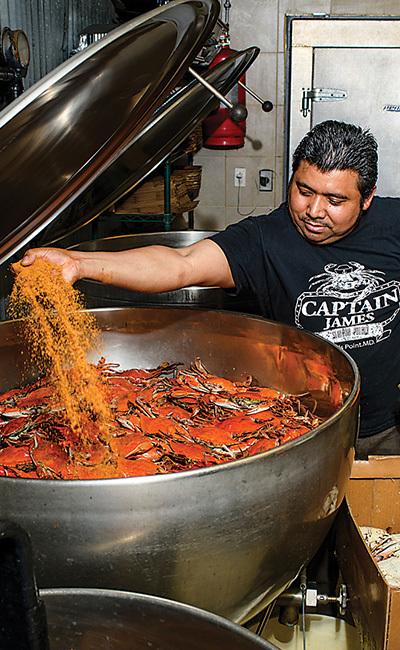 Throughout its nearly 50-year run, this family-owned Dundalk landmark has gained a loyal following for its colossal crabs spiced with a house blend that hasn’t changed since 1971. Unlike many spots that are first-come, first-served, diners can specify size and reserve their crabs when they make reservations here. Beyond the hard shells (11,000 domestic crabs are hand-sorted each week! ), there’s so much to love here, from the old-school Bawlmer atmosphere to the walls papered with signed photos of local luminaries such as Cal Ripken Jr. and Kathy Lee Gifford. Not to mention the yummy Boardwalk-style fries and a sandwich known as the “Baltimore Club,” stacked with shrimp salad and, what else, a classic crab cake. Since there’s no such thing as too much crab in one’s life, consider some ready-made cakes to go. "the open-air deck is A TRUE-BLUE EASTERN SHORE EXPERIENCE with chester River views and watermen lining the docks below." When it comes to feasts, there are few more idyllic settings than that of Harris’ at the Kent Narrows. The open-air deck is a true-blue Eastern Shore experience with scenic views of the Chester River, an adjacent decades-old packinghouse—one of the last of its kind in Maryland—and watermen lining the docks below. You know you’re in the right place when each table comes equipped with a red wooden crab bucket filled with paper towels, malt vinegar, and Harris’ own house-blend seasoning. Only pay mind to the local seafood, like a pail of Chesapeake cherrystone clams or a pile of hard-shell crabs. Whether mediums or jumbos, they’re all heavyweights and best eaten with comforting sides such as foil-wrapped baked potatoes. Always save room for the house-made Nutty Buddy ice cream cones. SOME FAVORITE SIDES AT NICK’S. 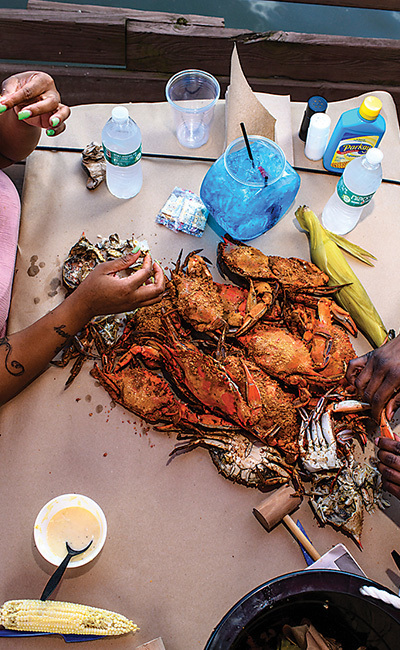 Few city-limits crab feasts feel more quintessentially Baltimore than that of L.P. Steamers. This Locust Point rowhome-turned-seafood shack has all the fixin’s, from indoor picnic tables and cheap pitchers of Natty Boh to a stellar roof deck with up-close views of Domino Sugar. Start with a basket of salty-sweet hushpuppies before moving on to the main event over brown paper with a branded wooden mallet. Open year-round, L.P. does its best to source local whenever possible, using a steady mix of Maryland and Louisiana crabs. Here, you’ll find anything but slim pickings, from small shells to giant jumbos. Prices start as low as $35 a dozen for smalls. Complete your feast with other briny beauties, such as local oysters, littleneck clams, snow crab legs, and lobster tails, plus classic sides such as seasonal corn on the cob and curly fries. After more than 60 years, this sports bar has become a seafood stalwart, revered for its Poseidon-approved portions, plethora of TVs for O’s and Ravens games, and, of course, its friendly proprietor—actually named Mr. Steve Eliades (the restaurant is named after his father). 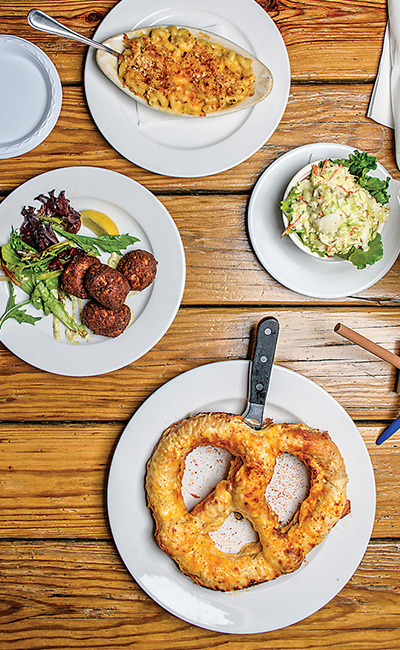 Snag a table, order a bucket of beers, and peruse the massive menu for the ubiquitous crustacean, served atop soft pretzels, swirled into dip, or stuffed into mushrooms. There is no terrace or inn here, but that’s beside the point. Homegrown pickers (and tourists alike) come here to go knuckles-deep in a hot heap of steamed-to-order shells. And while a recent renovation has led to a more modern aesthetic, this Essex crab joint hasn’t wavered where it matters most: its complete commitment to serving some of the heaviest blues in town. 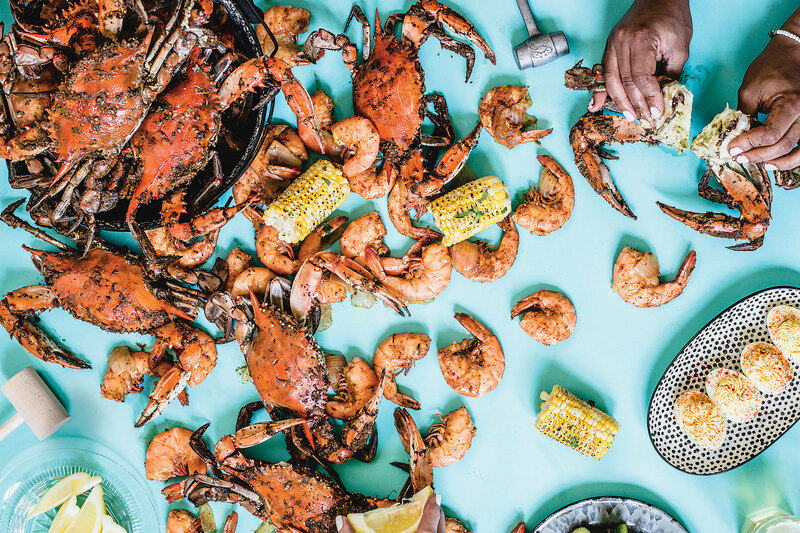 Like many things in Port Covington, Nick’s Fish House is owned by Under Armour founder Kevin Plank, who was wise enough to put the management team from Starboard, the famed restaurant and bar in Dewey Beach, in charge a few years back. The result is a beach-like vibe right in our backyard, with a large wooden deck, a long bar, string lights, and the occasional live acoustic act. For the optimal experience, score an outside table overlooking the Patapsco River. This is a place that draws plenty of locals, though tourists also flock. In fact, on a recent visit, a server assisted a crowd of Midwesterners, giving them step-by-step instructions on how to crack a pile of heavy hard shells. 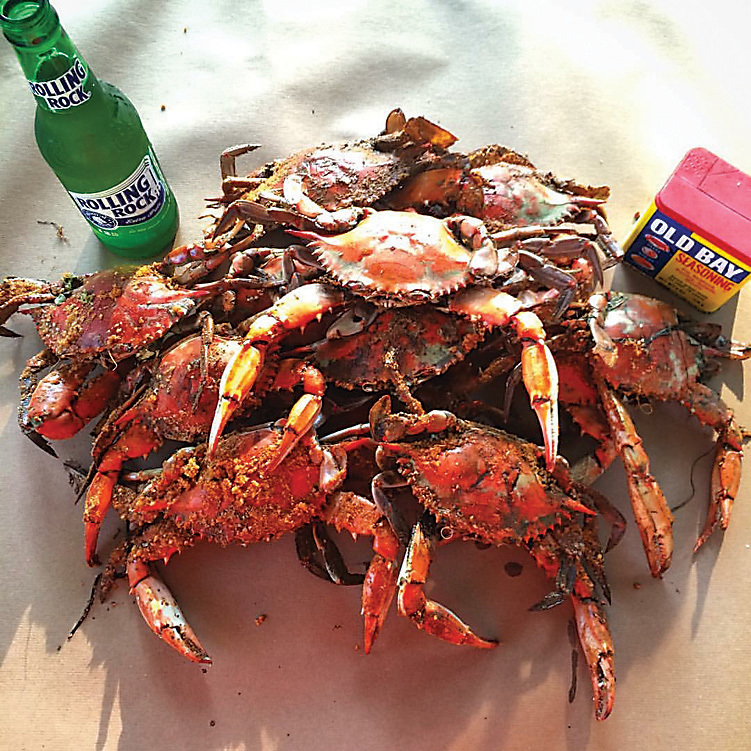 Go for the crabs, but while you’re there, also enjoy crab dip and affordable bottles of Boh. WASHING STATION AT NICK’S FISH HOUSE. Somewhere between the billiards table, the bar, and the bathroom, there’s a framed silver medal on the wall that might make you wonder about this 68-year-old Essex institution. Get a little closer, and you’ll soon see that it’s a James Beard Award, bestowed upon this spot in 2017 for being an “American Classic.” Fortunately, fame has not changed a thing. And that’s exactly the point: the crabs, sourced locally whenever possible, arrive straight from the steamer all hot and hefty, beer is served in orange plastic pails, servers are the right combination of tough and tender, and sides, like applesauce and macaroni salad, remind you of everything that’s good about the world. We also love that you can’t swing a fishing rod without hitting a stuffed marlin mounted on knotty pine. In other words, this place is priceless—as is fitting for something considered a classic. Growing up in Maryland, you don’t remember your first crab feast the way you remember, say, your first beer. Especially on the Eastern Shore. The crab feast feels like it was always there, those hundreds of hazy afternoons blurring like old Polaroid pictures—the fine lines of it all fading away until the only thing that remains is that timeless, familiar feeling. For me, those sun-bleached flickers feature a little kid, sitting on her young dad’s knee, being fed a few perfect pulls of backfin and first salty sips of Rolling Rock beer—or a not-quite-teenager, bikini-clad on a picnic-table bench, boldly diving into a piping-hot pile. In those split-second flashes, there is Dad, in his Ray-Bans and khaki short-shorts, taping down paper over the worn wooden table out on the oyster-shell-speckled patio that overlooks Langford Creek off the Chesapeake Bay. And then there is Mom, with her tanned skin and waist-length braid, carrying a pot full of steamed corn in one hand and a silver platter of succulent sliced tomatoes in the other. Sunburned and barefoot, my sister, Erin, and I douse ourselves in bug spray and scramble to our seats. Then, finally, as if some maestro has waved his magic baton, we settle in amidst the cicada symphony that hangs in the molasses-thick Maryland summer air. Over the course of a few hours, time slows down, and there’s no care in the world other than finding every last shred of crabmeat. Mom painstakingly picks each crab with buzzard-like precision while Dad shares old stories, cracks cornball jokes, and cares for little much besides the backfin and claws. Erin digs out the mustard of discarded shells and devours the outcast innards with gluttonous glee, while I slowly build a stash of prized pickings for Mom to make into her world-class crab cakes. We prick our fingers. We get Old Bay in our eyes. We light a few old gas lamps as the twilight sets in, keeping up the good work until it’s almost bed time. When we finally amble inside, the yard is littered with forgotten legs, sweet-corn skeletons, and a few empty beer bottles that blew over in the balmy breeze. All these years later, on the eve of my 30th birthday, the ritual endures. The minute details have disappeared, but we don’t need them—the rolling out of the brown paper and the finding of the fattest crab from the bottom of the wax-lined box became second nature long ago. Whatever our age, we just waste away the sunlight, fill our bellies, and forget about being grown-ups for a little while. One crack of a bright-red claw and we’re all instantly kids again.